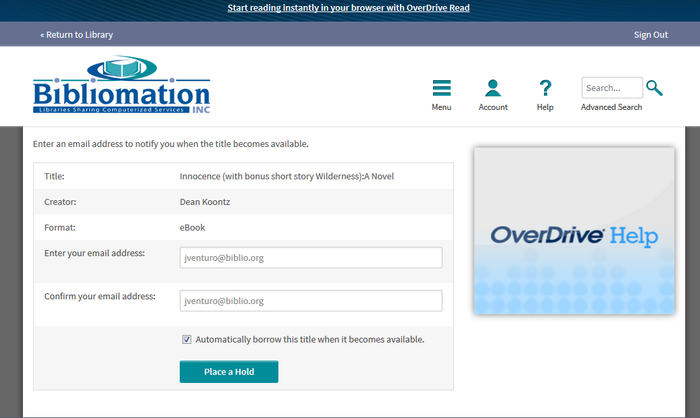 Get free ebooks from Bibliomation's OverDrive site! 1. Go to Bibliomation's OverDrive site. 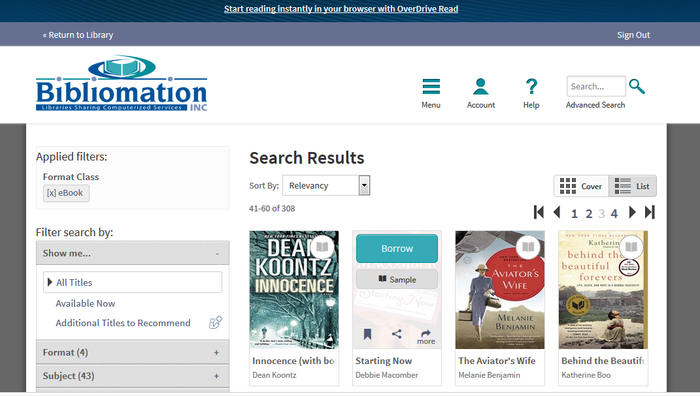 From your home computer, go to http://bibliomation.lib.overdrive.com, or access Bibliomation’s OverDrive site from you library’s website. If you are a first-time user, proceed to step 2. If not, skip to step 4. 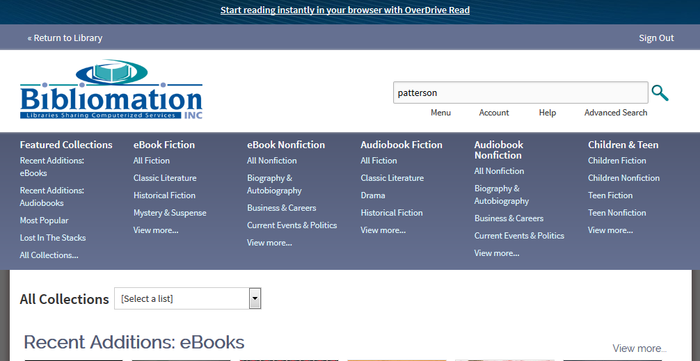 On the OverDrive site, click on "Help." Click on "Applications." 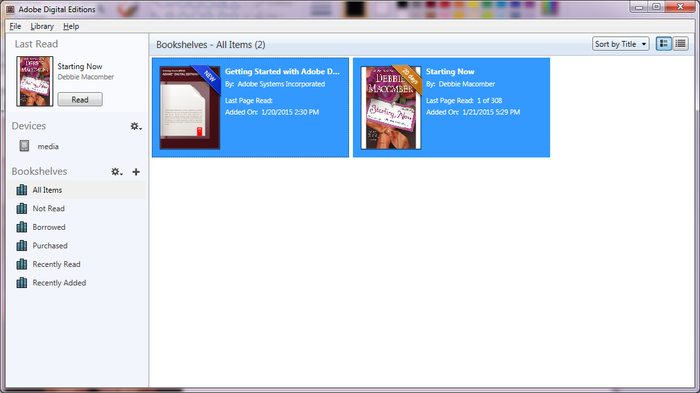 Then click "Adobe Digital Editions." This will bring you to the Adobe website. Look for a link that says "Download Now" and click it. 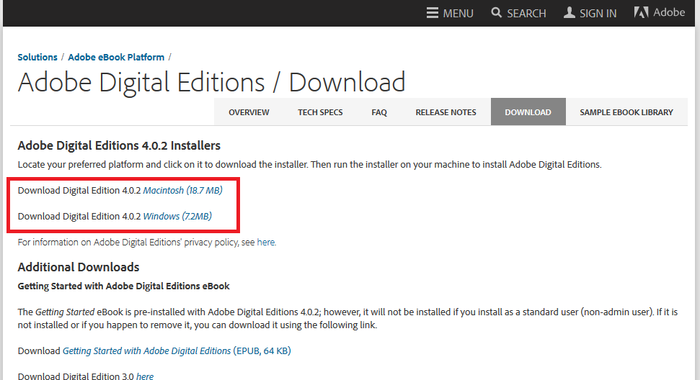 Choose the appropriate version of Adobe Digital Editions for your computer (either Mac or PC), and follow the prompts to install the software. Click on "Adobe Digitial Editions." 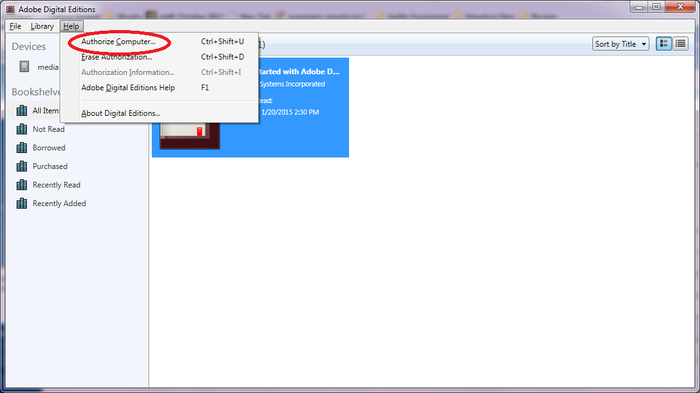 If it doesn't open automatically, open the program form your desktop (for PC users) or finder (for Mac users). 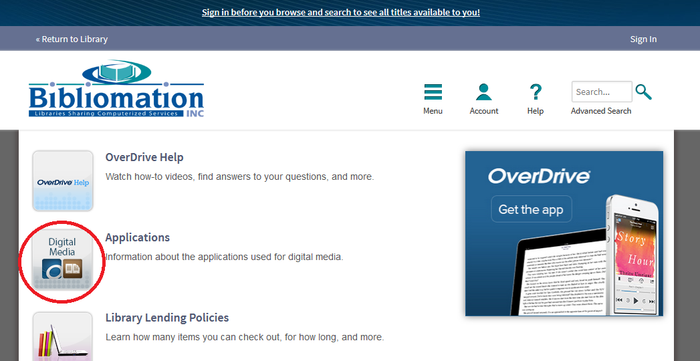 In Adobe Digital Editions, go to the "Help" menu and choose "Authorize Computer." Click "Create an Adobe ID." Your browser will open the sign in page for Adobe. Click "Get an Adobe ID." Fill in the form and click "Sign up." 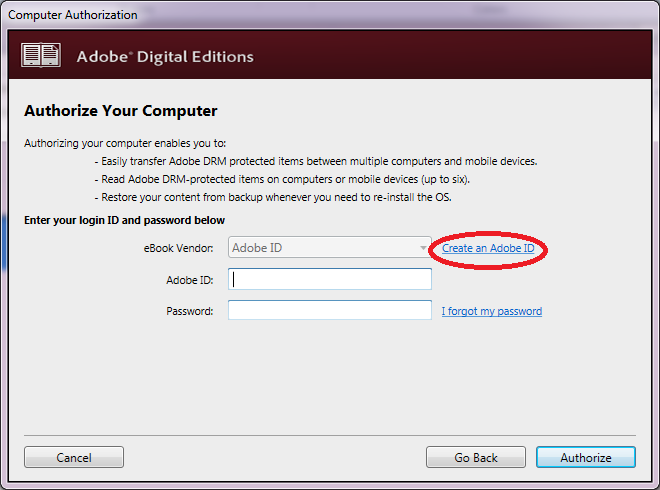 Go back to Adobe Digital Editions and enter your Adobe ID (your email address) and the password that you just created. Go to the "Help" menu and choose "Authorize Computer." Click "Create an Adobe ID." Click "Get an Adobe ID." Fill out the form on the next page. 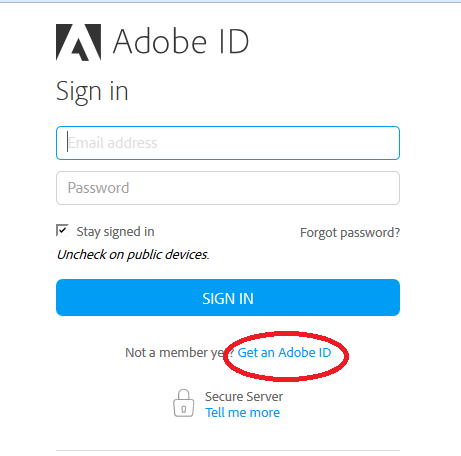 Then, go back to Adobe Digital Editions and enter your Adobe ID (your email address) and the password you created. Click "Authorize." 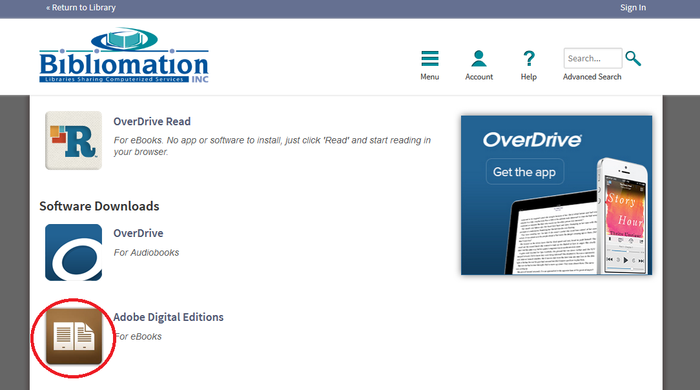 Close Adobe Digital Editions and return to Bibliomation’s OverDrive site. Begin typing your library’s name. Choose it from the list when it appears. Then, type in your library card number. Begin typing your library’s name. Choose it from the list when it appears. 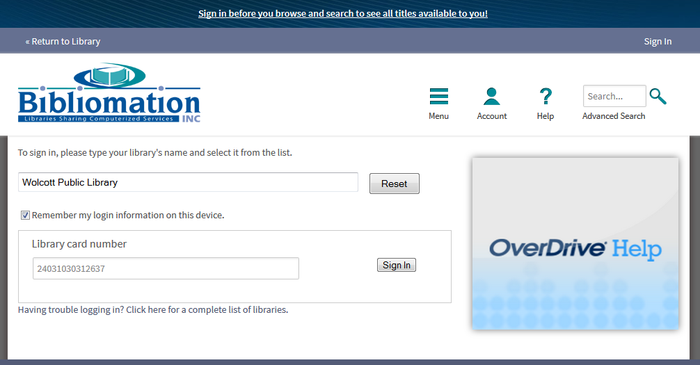 Type in your library card number and click "Sign in." 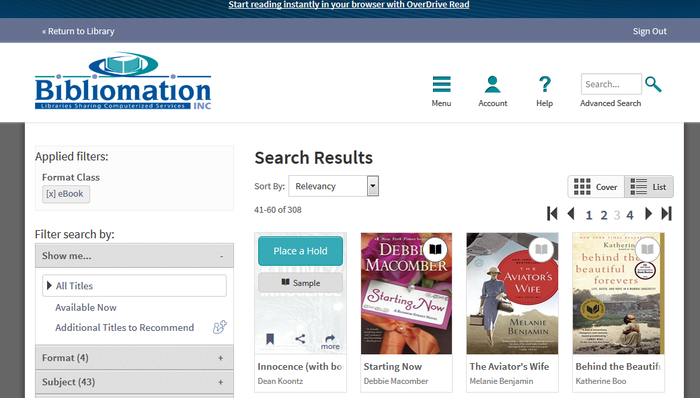 You can browse the collection by choosing a category from the home page, or by clicking in the “Search” box and entering a title, author, or keyword. Click on categories in the menu to browse the collection. Click in the search box and begin typing to search for a particular title, author, or subject. You can click "Advanced Search" for more search options. Hover over the book cover. Click "Borrow" to check out the book. If all copies of the book are checked out, you will see a "Place Hold" button instead. Click here and enter your email address to be notified when the book is available to check out. Click "Borrow" to check out the book. If the book is not available, you can place a hold on it. Enter your email address and click "Place a Hold." 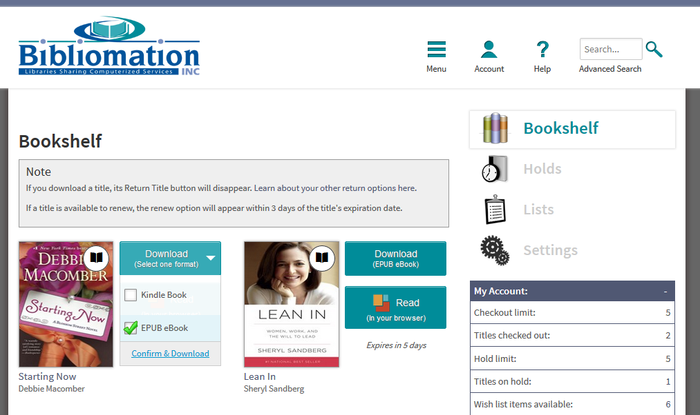 If you leave "Automatically borrow this title when it becomes available" checked, you will receive an email stating that the book has been checked out to you when it becomes available. If you uncheck it, you will receive an email stating the book is available and you will have 72 hours to check the book out before it moves on to the next patron on the hold list. Once the book is checked out to you, it will appear under Check Outs in your account. Click the “Download” button. Select "EPUB eBook," then tap "Confirm and Download." 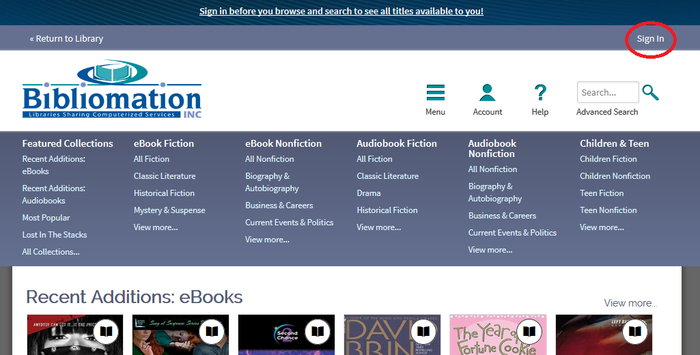 Click the "Download" button, select "EPUB eBook," then tap "Confirm & Download. 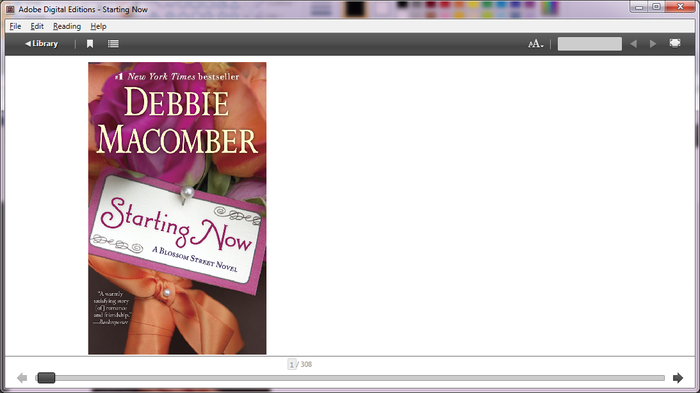 When finished downloading, the book will open in Adobe Digital Editions. 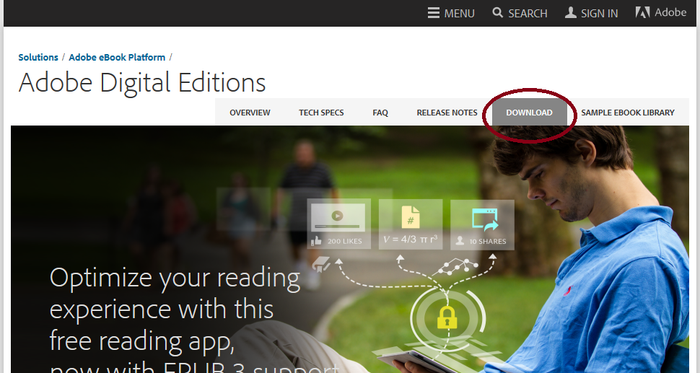 Click on "Library" to return to the main screen of Adobe Digital Editions. Connect your Nook to your computer. 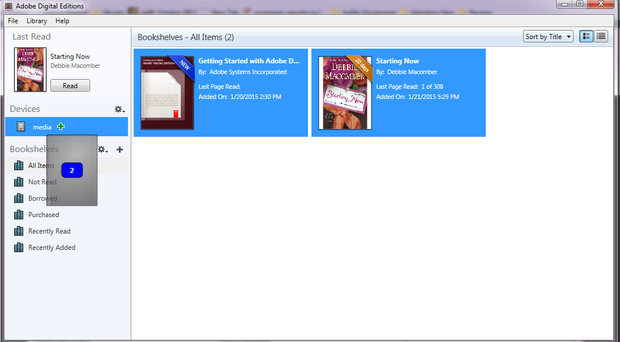 When your Nook has been detected by your computer, it will appear under “Devices” in Adobe Digital Editions. Click on the book and hold down the mouse button. Drag the book over to your device and release the mouse button when a green plus sign appears. Once the transfer is complete, you can disconnect your Nook and start reading! 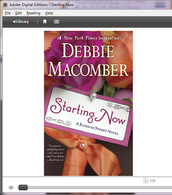 If you don’t see the book on your home screen, go to My Files/Stuff > Documents > Digital Editions. Need more help? Click here to contact support!